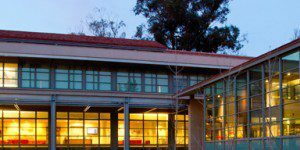 The Claremont University part-time MBA program at Drucker Graduate School of Management is designed for working professionals who want to pursue their degree while remaining in the workforce. The coursework takes eight semesters or at least two and a half years to complete, including two summer sessions. Like the full-time program, the Claremont University part-time MBA program is 60 credit units. Enrolled students take eight credits each semester, with the exception of their first summer term when they only take four. Quantitative Methods and Marketing Management are taken in the fall of the first year, followed by The Drucker Difference, Macroeconomics, Financial Accounting, and Managerial Accounting in the spring. During the summer of year one, student enroll in Organizational Behavior. Corporate Finance and Applied Operational Methods round out the second fall semester; part-time students take their final core requirement, Strategy, in the spring along with one four-credit elective course. The remainder of the program is devoted to the completion of six electives. If a student has extensive experience in a core course subject area, it is possible to waive a course by taking an exam or providing proof of mastery on a transcript. Waiving courses does not count toward the 60 credits needed to graduate from the program. In addition to on-campus classes, part-time students have the chance to study abroad as part of one-week trips organized each year. In the summer, students can travel to Prague, China, Costa Rica, or New Zealand as long as they have maintained a previous GPA of at least 3.0 for one semester. The typical Drucker Graduate School of Management features just over 300 students, representing 27 countries. About 32 percent of the class features students born outside of the United States. Claremont University part-time MBA students have access to the services of Drucker’s Career Management team for life. These include one-on-one coaching sessions, skills workshops, online discussions, print and online job search resources, employer guest speakers and presentations, on-site company events, and industry-specific networking nights. The current tuition for the entire Drucker MBA program is $114,120. Including the mandatory student fee of $300 per semester, this brings the total to $115,320. There are a variety of scholarship opportunities available to incoming students from all backgrounds. Drucker has several fellowships named after the school’s namesake in addition to diversity and not-for-profit scholarships. The school also participates in the Yellow Ribbon Program and has a partnership benefiting former City Year corps and staff members. Applicants are automatically considered for merit-based scholarships. Students looking for outside funding can investigate the options available through the federal government, like Direct Unsubsidized and Direct PLUS loans, and from private lenders. To be considered for admission to the Claremont University part-time MBA, students must have received a bachelor’s degree or U.S. equivalent from an accredited institution. Three years of professional work experience is recommended, but not required. Applicants may submit their materials online or by mail to the admissions committee. A completed application includes the following: a complete application form, official undergraduate transcripts, official GMAT or GRE scores, two letters of professional recommendation, responses to two essay questions, a resume, and an $80 application fee. International applications must also submit TOEFL scores. The program requires minimum scores of 600 on the paper-based test, 250 on the computer-based test and 100 on the internet-based test. An interview is required for admission, and the admissions committee contacts all students who they would like to interview. An interview invitation can be sent out any time after a completed online application form and resume are received. On-campus interviews are recommended; in some circumstances a telephone interview is an option.